We all want a beautiful, appealing smile. But, time and usage take a toll on your smile's brightness. Stains from coffee, tea, soda, tobacco, and even some foods may begin to discolor the surfaces of your teeth. Prescription-strength Zoom! Whitening® systems are only available through your dentist, and we can get you in and out with a stunning smile in as little as an hour. Or, you can use our convenient Take-Home Whitening system, which allows you to whiten at your pace and schedule. Get a stunning smile in just one hour! 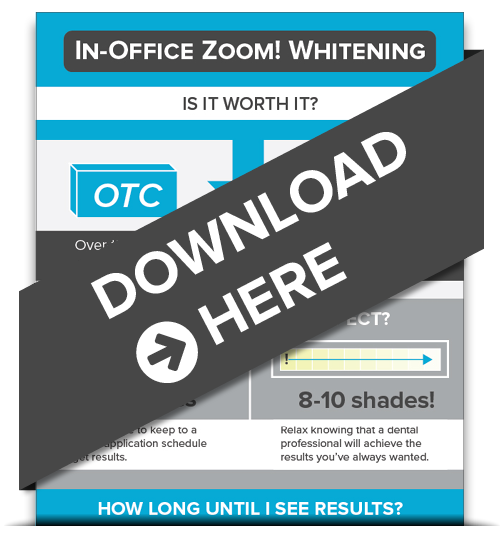 Why Choose Zoom!® over OTC Whitening? Teeth whitening is one of the easiest ways our Tulsa patients can get a quick and dazzling smile makeover. How do Zoom!® and Take-Home Whitening work? We have two whitening options - one of them could be the perfect fit for you!